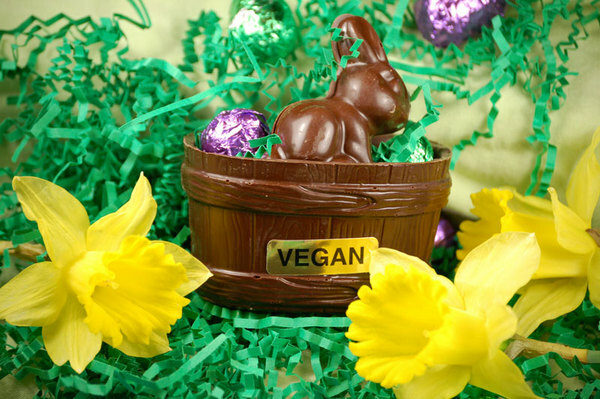 Celebrate a vegan Easter holiday with vegan chocolate Easter bunnies, a vegan Easter basket and a vegan Easter dinner! Let’s start with the baskets! There are many sources for vegan sweets and chocolate. For vegan “marshmallow” chicks and peeps, Sweet & Sara offers a pack of one of each (endearingly named Skipper and Sunny) for $4.49. Rescue Chocolate offers vegan chocolate crème filled eggs, $5.00 for a single egg, or $19.85 for four. Vegan Candies of all varieties can be found and purchased on Pangea’s website. Sjaak’s Organic Chocolates offers a vegan Easter basket made completely out of chocolate with a vegan chocolate bunny and eggs for only $10.75. Allison’s gourmet offers many vegan Easter confections such as gift baskets, peanut butter cups, chocolate bunnies, peppermint crème patties, and chocolate almond toffee. For candy that is “accidentally vegan,” check out PETAkids.com’s list of vegan candies. That messy transparent plastic “grass” used to fill Easter baskets can become quite a hassle when it gets stuck to everything! Instead of purchasing this plastic grass, try a more eco-friendly option like recycled newspapers or craft and wrapping papers you have around the house. Use a shredder to cut the paper. (If you don’t have a shredder, you could try making thin slices with the paper cutter at a FedEx Kinko’s or at your workplace). We’ve also read that you can sprout wheat berry grass. It only takes a week to grow a lush grass filling for your vegan Easter basket. Use wooden or plastic eggs and non-toxic paint. Or… use vegan white chocolate! Carve, (or if using chips, slightly melt and mold), the white chocolate into the shape of an egg and use a chemical-free dye. We found a chemical free dye made by India Tree. There may be others near you. Give a living gift by planting a garden of edible plants and spring-blooming flowers. Create a tasty gift of your own vegan baked goods and fill a basket with seasonal favorites such as muffins, scones, and home-made carob chocolates. Now you’ve got the basket, the candy, the recipes… you’re ready for a fabulous Easter holiday. Happy Easter!